All three Monsters are in love with this practice mute, endorse it wholeheartedly, and use it all the time. It is an essential tool for trumpet players at every level. • Very quiet. Practice with confidence backstage, in apartments, dorms, in the pit, hotels, outdoor parks, when everybody is asleep, in airports, on planes! • Free-blowing. Best feel and intonation (in all registers) of any practice mute we have tried, and we have pretty much tried them all. • Lightweight. Durable. Made from ABS plastic. • Comes with a convenient soft fabric carry bag. • Creates only a very small amount of back-pressure compared to other practice mutes. • Helps to open and develop the throat muscles. 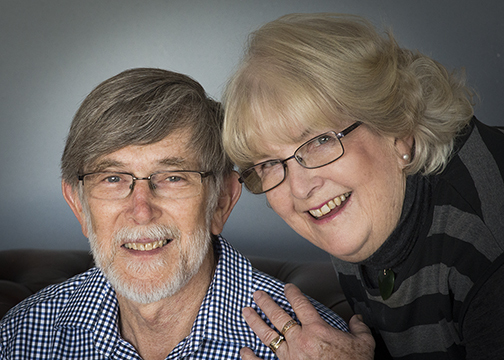 This is the amazing Trevor and Betty Bremner. They were our next-door booth-neighbors at Midwest 2014 (our first year). That's not why we love their products, but it is how we know what fantastic people they are. Warranty: If you have any issues, talk to us, we'll make sure you're happy. Boom.